Like almost all kitchen scraps, you can add sugar to your compost pile. 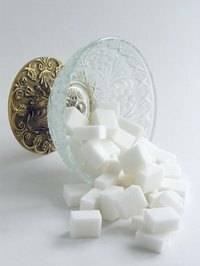 Sugar will increase the population of helpful bacteria and speed up the decomposition of your compost pile. You should include the normal compost ingredients in your pile when you plan on adding pure sugar to ensure there is enough nitrogen to support the bacteria population that will result. You may also have to take steps to keep bugs away from the pile. Place your compost bin in a shady spot. Add equal parts leaf litter and grass clippings. These are the browns and greens of your compost pile. Both are essential to creating a balanced compost pile that can decompose sugar. The exact amounts will vary with the size of your compost bin. Mix the browns and greens with your pitchfork. Add water to the pile with your garden hose. Only add enough to make the material moist to the touch. Wait two weeks to allow some material to break down. You can continue adding grass clippings or leaf matter as time passes. Dig a hole to the center of your pile with your pitchfork. Add any kitchen scraps you've collected, including coffee grounds, vegetable matter, and egg shells. Pour the sugar you need to compost directly over the vegetable matter. Use your pitchfork to stir the added materials and mix in some existing matter. Fill the hole back in with compost matter. Cover the compost bin with a tarp, if it doesn't come with a lid. This will keep out bugs. Use your pitchfork to stir your compost pile once a week. When the matter is a dark brown color and resembles the texture of soil, you can spread it on your plants. Garden Rant: Do you Take Sugar With Your Dirt?